Some people call them desert island reads, mine are the ones I MUST HAVE in hard-copy as “insurance against the apocalypse”. 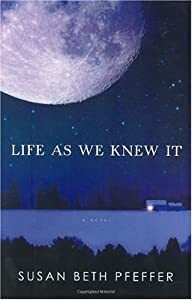 After reading Susan Beth Pfeffer‘s Life As We Knew It my sense of disquiet was not centered on rational things like how to survive in the event of a global catastrophe. No, no. My first thought was, I couldn’t possibly rely on my e-reader because how would I charge it (I know what you are thinking, what about a solar charger, dummy? But my only defense is that I was in a state) so I was left with no choice other than to ensure that I had a complete library to rely on in the event that the four horsemen were coming. To see the list of books I couldn’t live without and the rest of my rationale check out Dreadfully Good.